Click to open remote window. 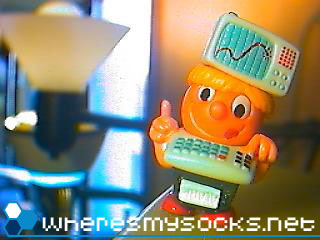 wheresmysocks.com // My "commercial" web site. It's where stuff that have been working pretty well on this site ends up. I also use it as a little brochure for my web design and programming services. CLA Student Services // My current place of employment. Specifically, I am the associate web manager for the Assistant Dean for Student Services at the College of Liberal Arts, University of Minnesota - Twin Cities campus. The web unit page has a few of our projects. Ancient Imports // This is one of the first major sites that I designed. The owner is Marc Breitsprecher, a family friend living up in northern Minnesota. Check it out, buy a few coins. Support Marc. stats.HaloFit.org // Lots of stats regarding the performance of various professional Halo 3 players in both MLG tournaments and Xbox Live scrimmages. Alaska 2002 // View some pictures from my trip to Alaska. XM Install Pictures // View the image galleries of the XM install in both the old '92 Explorer and the new '03 Focus.